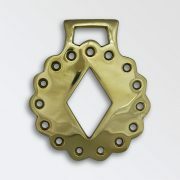 We have a wide range of pattern brasses, all modern casting but made and finished to our KB standard. 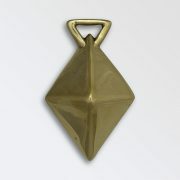 These designs are taken from our collection of original patterns, some of which are very old and some are more modern. Cast from one of our old original patterns. 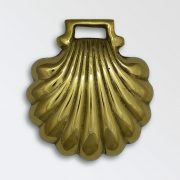 This is a Scallop/shell design, hollowed out at the back. 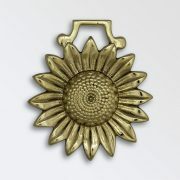 This was cast from an original old pattern, but I don’t believe it was originally intended as a horse brass, I believe the hanger would have been a later addition added to the Sunflower decoration. 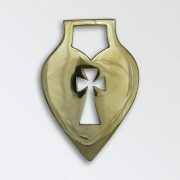 A stunning design and heavy. 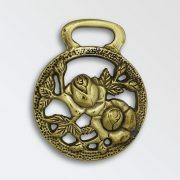 This was cast from one of our original pattern but again I believe that the hanger was a later addition, the rose was probably a decoration with another purpose, but some enterprising foundry worker added the hanger back in the day and made it into a horse brass. 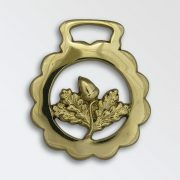 This was cast from one of our original patterns. 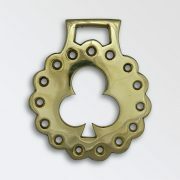 I have seen this design in many an old horse brass book but whether it was originally made as a horse brass or if the hanger was added later I don’t know. Cast from one of our original patterns. 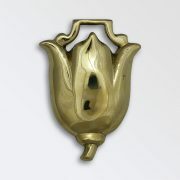 A petty and delicate brass with a modelled rose in the centre of a half moon and triangle pierced outer and a scalloped surround. Cast from one of our original patterns. 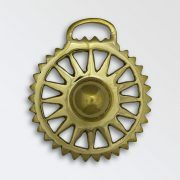 A lovely delicate brass with a modelled acorn in the centre and diamond and round pierced outer and a scalloped outer. 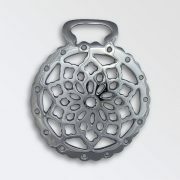 Cast from one of our original old patterns. 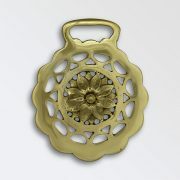 A beautiful and delicate flower in a pierced outer. This really is a stunning brass with a scalloped surround. 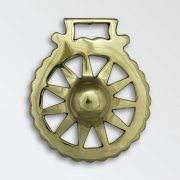 This is the same design as above, but it has been plated in white metal, this is chrome plated, we can also Nickel plate. 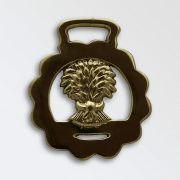 All our brass items can be plated. Cast from our old patterns. 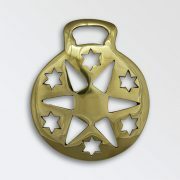 One big cut out star, solid centre, surrounded by 6 smaller pierced stars, within a smooth surround. Cast from one or old patterns. 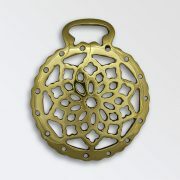 A plain raised or embossed centre with 14 pierced holes around the edge with a scalloped surround. Cast from one of our old patterns. 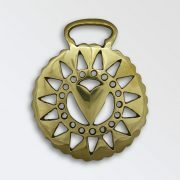 A plain embossed/raised centre with 16 sun rays within a spikey outer surround. A very popular design. Cast from one of our old patterns. This is a plain embossed centre with 11 Sun Rays within a scalloped surround. Cast from one of our old patterns. 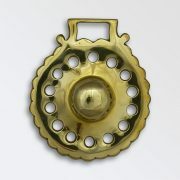 This brass has a pierced centre with 16 half-moons pierced into a round swirl, a punched but not pierced holes and lines on the outer and a scalloped surround. 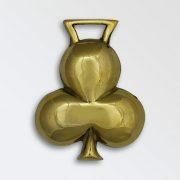 This is cast from one of our modern designs. 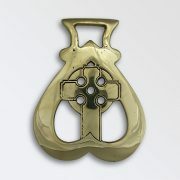 A Celtic design cross with in a pear-shaped surround with 5 pierced holes in the centre of the cross. Cast from one of our old patterns. 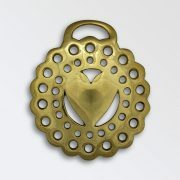 A Celtic type cross cut out of a solid heart shaped surround. Cast from one of our old patterns. This brass has a small solid heart centre with double row of pierced holes within a scalloped surround. Cast from one of our old patterns. 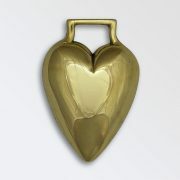 This brass has a small solid heart centre which is cut out from a plain outer within a scalloped surround. Cast from one of our old pattern. 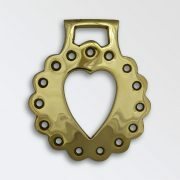 This brass has a small solid heart, cut out and surrounded by 17 pierced holes and 5 pierced triangles. A very popular design. Cast from one of our old patterns. 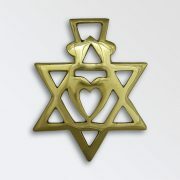 This brass has a small cut out heart within a small solid heart which is surrounded by a 6-pointed star or two triangles which have 5 smaller pierced triangles. Cast from one of our old patterns. 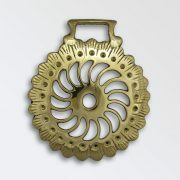 This brass has a pierced centre with 4 pierced shapes around it, 8 horse shoes around the centre and 8 horse legs making up the design of the surround. Cast from one of our old patterns. 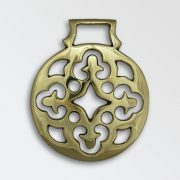 A pierced geometric pattern within a smooth sided surround. 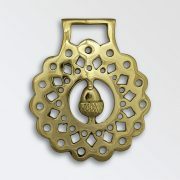 A pretty delicate design. Cast from one of our old patterns. 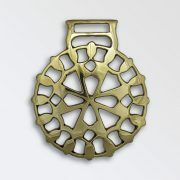 A pierced geometric design with a pierced cross in the centre and a bumpy surround as the design comes over the edge of the brass. 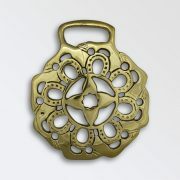 Cast from one of our more modern patterns. This brass has a modelled wheatsheaf centre with a plane outer edge within a large scalloped surround. Cast from one of our old patterns. 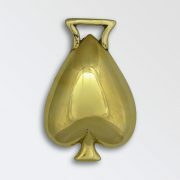 This is a bold/convex Spade with a hollowed out back. Cast from one of our old patterns. This is a bold/convex Club with a hollowed out back. Cast from one of our old patterns. This is a bold/convex Diamond with a hollowed out back. Cast from one of our old patterns. 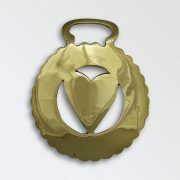 This is a bold/convex Heart with a hollowed out back. Cast from one of our old patterns.